My father was a guitar-playing disc jockey, so music has always been a big part of my life. It's no wonder a day doesn't go by without music filling our house. I have to admit though, it's been a little quiet at chez Moore lately because I've been hooked on listening to different radio programming: Podcasts. It started when my son got me hooked on Serial, a very addicting podcast that covers one story over 12 episodes. (It has nothing to do with writing, but I listened to the whole thing in less than two days.) And with the new NCW podcast, my obsession with these taped radio programs have begun. The great thing about podcasts, is that you can listen at your leisure. I've gotten in the habit of listening while I get ready in the morning, while doing housework, on the treadmill, driving, and even grocery shopping. Another perk: they're typically free. So I started asking around and doing some investigating, and came up with a list of free writing podcasts. And there's something for everyone. 1. Darken the Page with Dave Booda. Conversations and interviews with writers who share advice on "staying in the zone, producing memorable work, and enjoying the art of writing." 2. Creative Nonfiction. This podcast is from 2006, but don't let that deter you from tuning in; the information is still valuable and you'll enjoy the interviews with Natalie Goldberg, Michael Curtis and Lee Gutkind. 3. Dead Robots Society. This is an award-winning podcast that focuses on the journey of writing. The hosts are rather entertaining and funny, so it's pretty fun to listen to. 4. The Naked Book. This podcast is presented by Philip Jones, a writing and publishing expert. This is a great one to tune in to if you're curious about the current state of the publishing industry and what agents, editors, and booksellers are looking for. 5. Inside Creative Writing with Brad Reed. A big thanks to NCW member, Sheala Henke who suggested this podcast. This weekly podcast covers craft and technique for both fiction and nonfiction writers. I've noticed he hasn't done a podcast since last July, so hopefully he'll have some new ones soon. 6. The Q&A with Jeff Goldsmith. This podcast is all about T.V. and film writing. Goldsmith interviews those in the industry, including writers, directors, and producers. Even if you're not a screenwriter, many of the interviews are fascinating to listen to. 7. AmericanWriter.com Creative Writing Podcast. Hosted by Tom Occhipinti, this podcast focuses on characterization, narrative, plot, dialog . . . you name it. It's another oldie from 2006-2007, but is packed full of helpful, practical advice for writers. 8. Helping Writers Become Authors. I've been following this blog for a while and I find the content incredibly helpful. Author K.M. Wieland provides listeners with useful advice on everything from creating solid stories to landing a publisher. So how do you listen to these inspiring podcasts? For one, most of these you can tune in from your computer. 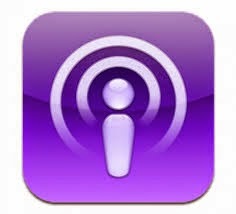 Generally, folks listen to podcasts while they're on the go, and if you have an iphone, it's pretty easy. Just tap on the Podcast app that's already installed on your phone and you can search the thousands of podcasts available. For an android, you can either install an app on your phone, or download onto your computer, plug in your phone, and transfer it over. This website gives detailed instructions on how to listen to podcasts for whichever device you have. Do you have a favorite writing podcast? FYI, the NCW Podcast is in the Top 50 of literature listens at PodOmatic. Thank you all for your support. That's great, Rich! Well done--and thanks for putting it all together. I love listening to podcasts--in the car, on a walk, while I am cleaning. They are wonderful. Great info! Thanks, April! I can't wait to check some of these out!